It’s that time again. Today we are revealing our December kit. Once again, I’m just as excited to bring you this kit. Tres Jolie will host a different challenge each month. This month We have a sketch challenges. This is sketch can easily be used to create a card, tag, layout or even altered project. We want to see what you do with our kit(s) and our sketch. Place your entries in the December Challenge folder on Tres Jolie Kit Club Cafe Facebook page. All are welcome to enter, however we’d love to see what you do with our kits. This challenge ends on December 31st, 2018 at 11:59 pm CST. September Kit Reveal and Blog Hop! Thank you for joining our very first blog hop! Make sure you leave a comment on all blogs for a chance to win a prize! And, make sure you have LIKED & FOLLOWED Tres Jolie on Facebook!!! This months kit is filled with a combination of papers from Prima Marketing and Bo Bunny (we kept it local this month). You will find a lovely assortment of patterned papers and perfectly coordinated embellishments. These kits are for the beginner to the advanced, clean and simple to mixed media maven. No matter your style, there is something for everyone. We know you are going to love it! Love them, right! You can still get one of your own. Become a subscriber and you will never miss out on our gorgeous, coordinated kits. Just visit Tres Jolie subscribe. 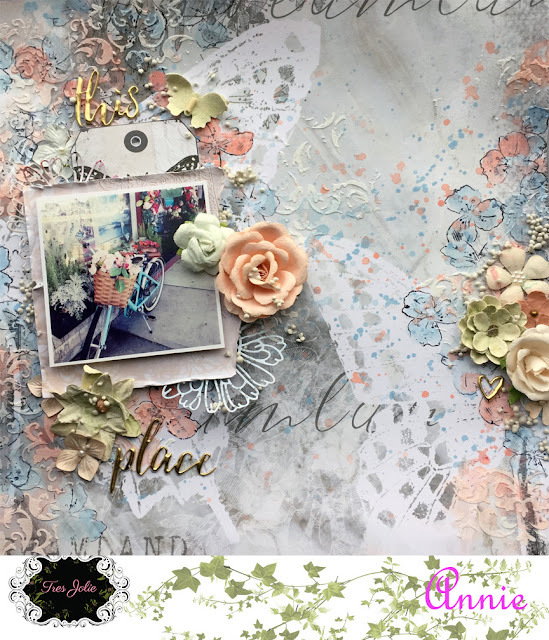 The designers at Tres Jolie have created some amazing layouts with this kit. Make sure you take the time on each blog to enjoy them. Tres Jolie will host a different challenge each month. This month we have a mood board. You can created a layout, card or OTP project using the mood board (doesn’t have to be with our kits, just no other kits please). You can be inspired by the colors or any object in the photos. Just let us know how you were inspired when you post your project. Place your entries in the mood board challenge folder on Tres Jolie Kit Club Cafe Facebook page. Want to win some prizes from Tres Jolie? 1: Visit all of the blogs and leave a comment on each. This way we know you were there. Take your time. There are REALLY beautiful things to see along the way. Plus there will be one secret winner from each blog. 3: For extra chances to win, make sure you follow us on all our Social Media. I will leave the links below. If you already follow us, Thank you and mention it in your comments. Also leave us a review on our Facebook page and that will get you another entry. 4: Finally, go back to the Tres Jolie Blog and leave a comment letting us know how much fun you had, tell us the sentence that was created with all of the special words you collected. Can’t wait to hear from you. The party starts over at Ginny’s blog and ends back here. Have fun! Thanks for joining us on our first ever Blog Hop! Hey everyone Kim here. I’m back today to share my project from the Mixed Media Kit. I love this kit because it’s unlike other mixed media kits, where you just get the mediums. This kit gives you a project to complete, so you can use the mediums in the kit right away. It’s got alcohol inks (the colors make a nice rusted patina effect), texture paste, bling and a wonderful resin butterfly project to use all your mediums on. I first mixed the texture paste with a fair amount of the 13@rts Magic powder. This will get very thick, and it won’t spread smoothly (that’s the whole purpose). It will give lots of texture. Once the paste dried, I randomly added the alcohol ink. I started with the browns, then added the patina color. For the inside of the wings, I used some wax from my stash and just melted it on the inside. Here is my weekly tip: When layering your color mediums, always start with your lightest color and if possible, dry between layers. Thanks for stopping by. Our designers will be back this week with more of their amazing projects form all of our June kits.